“We were literally four days before we opened the venue; there were still seven semis and construction equipment in our back-of-house,” enthused Brian Crowne, general manager, Operations and Programming at the Walmart Arkansas Music Pavilion (AMP). “[It was] Friday before the Saturday soft opening...with a Saturday morning [company] meeting and Blake Shelton that night. We’re literally cleaning the back stage, and they’re painting the hand rails, and the last video monitors are going in, and I’m going, ‘please God, get them up, because we’ve got to test them before tomorrow.’” Fortunately, for Crowne, Walmart executives, and 10,000 ardent music fans, the new video monitors worked beautifully. With all the monitors tied in together, live events are streamed to the VIP lounge & artist lounges. Crowne is an entertainment industry veteran and former co-owner of the AMP, which had been a temporary, seasonal venue. In 2011 the Walton Art Center purchased the AMP brand, and Crowne signed on as general manager. From the ground-up he built the Walmart AMP into a world-class, state-of-the-art, permanent amphitheater attracting top acts. 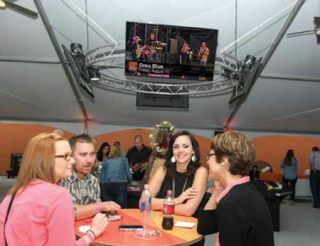 On Saturday, June 7, 2014, the grand opening Blake Shelton concert was sold out at the 10,000-capacity, Walmart AMP, now the largest outdoor music venue in Arkansas. “The goal to be as digital as possible was always there,” Crowne said. Being able to leverage Walmart’s long-standing relationship with Samsung gave the AMP team an opportunity to consider the impact of digital signage in every form factor: 8-inch Galaxy Tabs are used by wait and bar staff in the VIP lounge; 40-inch DM Series Smart Signage displays are used for menu boards in the concession areas; stunning 55-inch displays entertain guests in the VIP lounge and green room; and the massive 25-foot high by 14-foot-wide videowalls flank each side of the main stage made up of 36 UD Series ultra-narrow bezel displays. With all the monitors tied in together, the live event will be able to be streamed to the VIP lounge and artist lounges. There is also more flexibility for marketing and rotating sponsor recognition. “Something I want to do next year is incorporate into some of our emergency communication procedures,” he said.